Like many of you, I always have a knit or crochet (or both) project on the go. Most often, I have several. I have never really thought about why I like to create things from yarn - I just do. It is something I have always done and I find it hard to imagine that I would ever stop. I truly dislike finding myself with a spare moment or two and without a work in progress to keep my hands busy. (Any suggestions for an airline security friendly craft?). 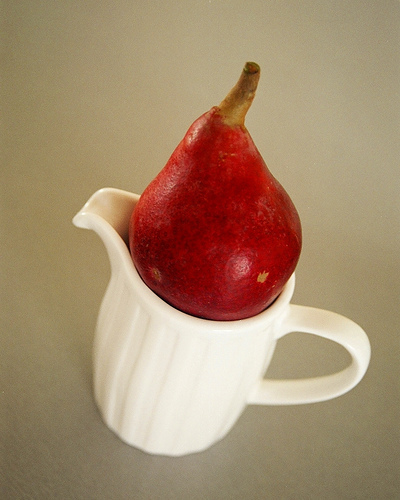 Recently I came across a new blog that I am enjoying immensely. beautiful things is written by an architect who loves to knit ( and knits prolifically, I might add) and appreciates the beautiful things in life.Want to ogle fiber? ...you can do that here. Want to see works in progress and finished things? Plenty of those too! Links galore so that you can find out where the yarn, patterns and inspiration came from. If you enjoy knitting, you'll most likely enjoy this blog. 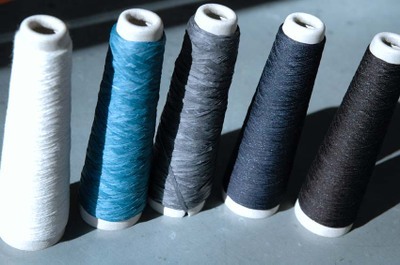 "One of the things I love about knitting is how you can create these amazing, three dimensional objects out of a single linear thread, in essence, a line. And all this through variations on a single stitch - a loop looped through a loop. And in one tug you can basically unravel the whole thing. A line doesn't take up three dimensional space. It's like making something out of nothing. It seems like such an optimistic process, creative in the literal sense, and so elemental. Perhaps that is why it is so healing and restorative a process. Words, for example, seem like much more of a social construct in comparison." So there you have it- and put so simply and beautifully. Not my own words but at last I will be able to explain just why it is I feel so compelled to knit. 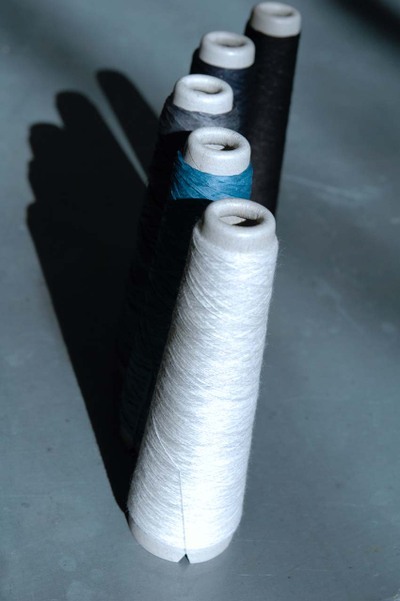 The images are of fiber for two new projects that I can't wait to start....this and this....silk & stainless steel (black ,navy), fine merino (white) and paper (charcoal,blue). 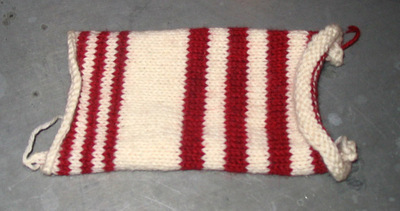 This stripey piece off knitting will soon look like this little fellow belonging to Alex at moonstitches . After I saw him I just had to try to make one and Alex very kindly helped me out with a pattern. She has recently finished her little " Hans " and is keen to see any versions that anyone else out there might create. Mine is ready to sew together and although there are other things I should be working on I just can't wait to see him with his face. Because he is most definitely a he ( maybe some plaits might make a "she"). While you're over at moonstitches have a look at the beautiful header - although it isn't polite to blow your own trumpet, I can't resist pointing out that I made the felt for this lovely piece. It makes me quite please and proud to see it used for such a satisfying outcome. 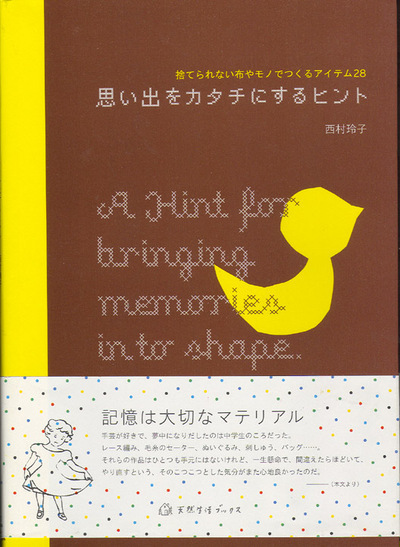 I cane across this book " A hint for bringing memories into shape" ISBN 4-86067-036-1 quite a few months back. 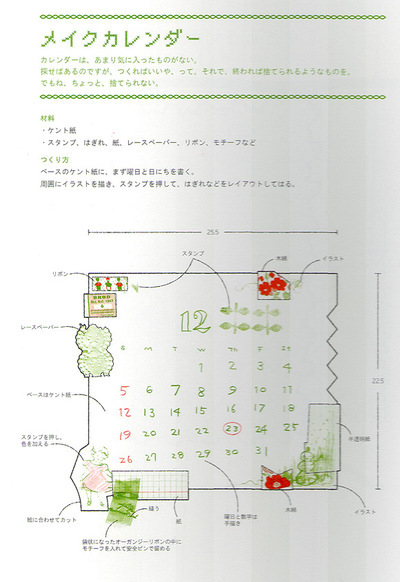 and have long wanted to create my own version of the handmade calender idea. 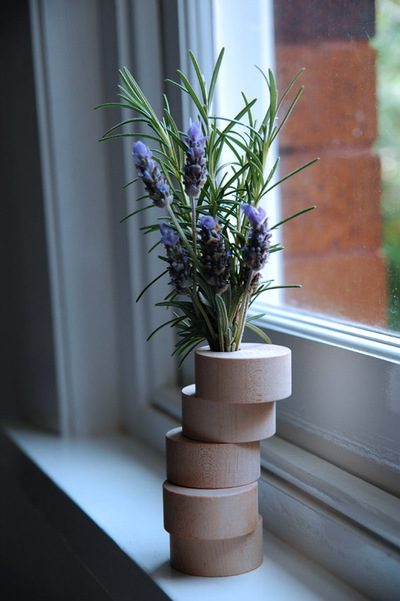 So beautiful and simple and I loved the way that it has just been pegged on a string. I have really enjoyed the challenge of the nikkishell's recent handmade postcard swap - no theme , simply that it must contain a handmade element in some form. I have received collaged, stitched, lino printed and hand drawn cards ( and some were combinations of some of these methods) all so individual. I recently went back to this book and came across the calender and thought why not?......so here is my idea. If there are enough people out there ( 4-6 would work - 12 would be better, ) then each person would make the page for one month - 12 times of course and send them out, keeping one copy for their own. At the end ( assuming it all went to plan) each person would have 12 pages, one for each month - a wonderful handmade one- of 12- limited- edition calender to give as a special present or keep for their own. It would be no more work than a postcard swap ( if you really wanted you could do copies of the page with the numbers then add the handmade touch) and able to be enjoyed for the next year. I thought that if I organised it now , with a post by date of the end of November, that would give people plenty of time and time for the calender pages to arrive by the end of the year . That way throughout the year, as I reach their page( because I would most certainly keep it for myself) it will be a welcome reminder of the amazing diverse and talented people that I have had the luck to come in contact with over the past few months. I get the feeling ( and hope) that I will stay in touch with some of them way beyond the land of craftblog, maybe even meet a few some day. 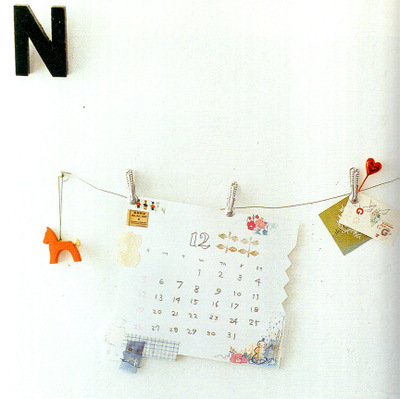 Anyway drop me a line if the calender idea appeals to you and, if I get enough of a response I'll start organising. update on numbers...as of July 4th 9.30 pm ( EST) we are at 11 people already...and such a talented bunch as well so I can't wait to see the results! I just love being part of Illustration Friday - it always gives me a little thrill when I read a comment from someone saying that like what I have done and then I follow the link to their page and see their extraordinary talent. And they have taken the time to not only look at my sketch but comment as well! Thank you ,thank you it really does spur me on...especially when this weeks "fat" topic was done while I was feeling rather ill and Charlie was playing at being Dr Jekyll /Mr Hyde baby. She's been that way for the last week - admiitedly she's had some dreadful throwing up/ upset tummy bug and hasn't eaten a decent meal in that time so she's feeling pretty crappy. At least fingers crossed that's what it is because if it's a stage my darling Cha's going through, it had better be a short lived one for all of our sakes! Here are just some of the wonderful illustration sites I've come across via Illustration Friday . Marjorie Ann has the most exquisite sketches and (I think) watercolour images that I have seen for a long time at Maejeak Ann and there are English translations as well so you can have the full experience. French toast girl is another great source of artistic inspiration..at the moment she is doing an illustration for every day in May - I can't begin to tell you the stress that this would cause me although I'd love to try it one month......a challenge for June maybe, then again May 2008 is looking promising ! One that I linked to from another craft blog is kitty genius - I loved her illustrations so much that I had to go straight to her Etsy shop and buy two...I can't wait for them to arrive and have I mentioned how much I love this Internet shopping thing...add to cart , boom , and it"s all mine! Dangerous stuff indeed. Now for anyone that is interested, I have a lovely collection of Japanese craft books which I will list and make notes about on one of those wonderful days when I have nothing else to do - however in my blissed out shopping state I have managed to order TWO of the same book! 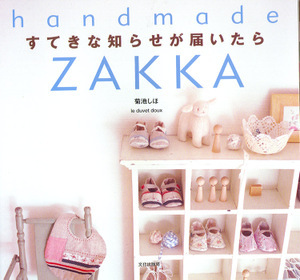 It is one of the Handmade Zakka books and has some lovely projects especially for those of you with a baby/about to have a baby/know a baby/ or know someone with a baby! That would cover just about all of us, I guess. Let's see- some beautiful baby bibs and shoes, a wonderful wall pocket for all those bits and pieces,some inspired knit/fabric cot blankets, cushions and bags just to mention a few. It's in mint never been used condition and is up for swaps for the first person to email me. I'll leave the actual swap content up to them as I love a surprise.....here's the cover so that you can check that you don't already have it....on its way to a new home!